To all my coconut peeps, I’ve got some sweet, spicy, crunchy goodness for ya today!! You’re going to start with a basic breading technique. You’ll mix the sweetened coconut into the bread crumbs. Why use bread crumbs at all you ask? 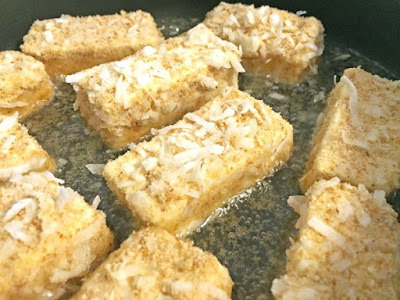 Coconut alone will not coat all the tofu. You need the crumbs to get in between the small spaces that the coconut fails to coat. Once all of your tofu is breaded, you’ll pan fry on each side until golden brown and crispy, about two minutes on each side. The sauce is very simple. Just three ingredients mixed together and you’re done! I would make the sauce ahead of time so it’s ready to use just as the tofu is coming out of the pan. Whisk milk and egg in a small bowl to make an egg wash. Coat one piece of tofu in the flour, then in egg wash. Then coat completely in bread crumb and coconut mixture. In a large skillet, heat oil on medium heat. 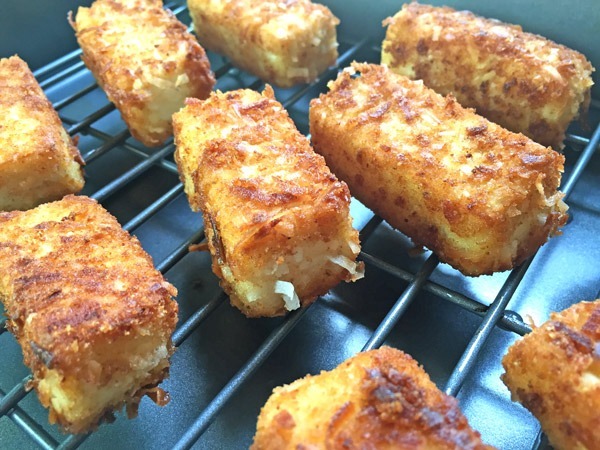 Once the oil is hot, add coated tofu. Cook each long side until crispy and light brown, about two minutes on each side. Serve immediately. 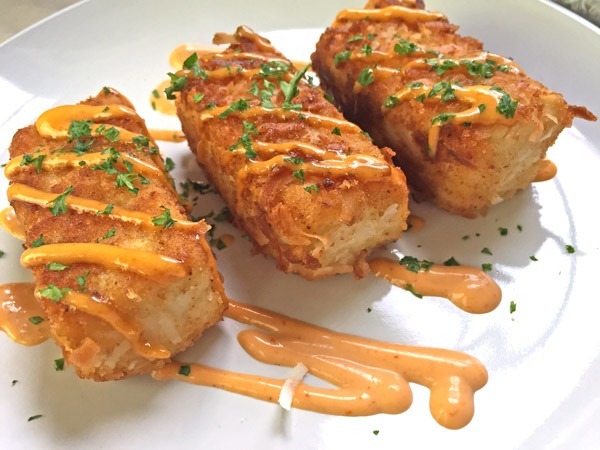 In a medium bowl, whisk together Sriracha, mayonnaise and ginger. Refrigerate until ready to use.